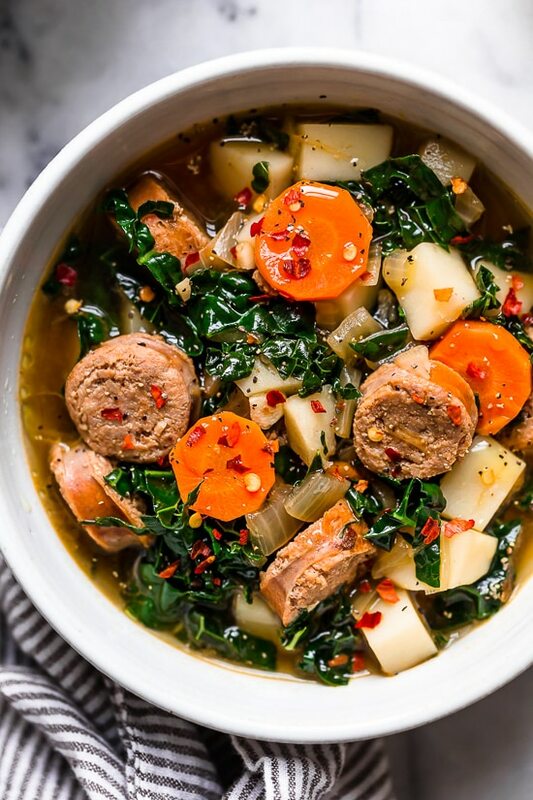 Kale and Potato Soup with Turkey Sausage is an easy, hearty soup made with kale, potatoes, carrots and turkey or chicken sausage. This quick and easy soup is the perfect one-pot meal, and a tasty way to enjoy kale, which is high in vitamins K, A and C with both antioxidant and anti-inflammatory benefits. Great for dinner, or meal prep if you like batch cooking because this recipe is freezer-friendly and tastes great reheated. A few more hearty soup recipes are Leftover Ham Bone Soup with Potatoes and Cabbage, Chicken Soup with Spinach and Whole Wheat Acini di Pepe and Chicken Sweet Potato and Kale Soup.